The story of one of Silicon Valley's largest figures will hit the stage of the War Memorial Opera House next year, in June 2020. 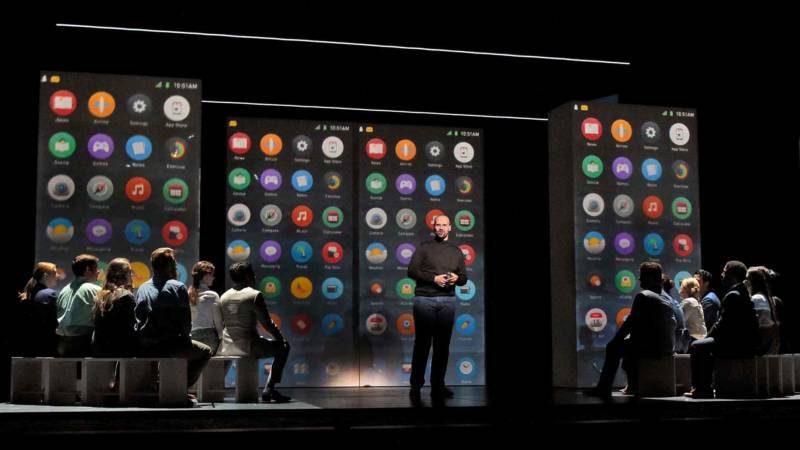 The (R)evolution of Steve Jobs, by Bay Area composer Mason Bates with libretto by Mark Campbell, made waves in its 2017 premiere in Santa Fe, New Mexico. It follows the Apple CEO after the introduction of the iPhone in 2007, as he faces mortality and looks back upon his life. Speaking with KQED, SF Opera's general director Matthew Shilvock says the opera isn't a simple "biography in music" of Steve Jobs. "Rather, he becomes the archetype through which we can understand the part of the world that we live in... success, ambition, family, love, work—all these things collide in our part of the world." The rest of the season, announced today, includes some other surprises, including works by Verdi and Puccini that the casual opera fan might not have heard of. Puccini's Manon Lescaut helped launch the composer onto the world stage, before La bohème or Tosca; it will be conducted by Nicola Luisotti, returning to the podium at SF Opera. And Verdi's Ernani, a Gold Rush-era hit conducted anew by James Gaffigan, includes the first aria ever recorded in San Francisco. Neither Manon Lescaut or Ernani are large attendance draws in smaller cities, but in San Francisco, "we should feel proud as a community that we are one of the companies in America who can undertake these lesser-known titles," Shilvock says. Also as part of the season is a new staging of Mozart's The Marriage of Figaro, Gounod's Romeo and Juliet, Britten's Billy Budd, Humperdink's Hansel and Gretel, and Handel's Partenope. Full details and tickets here.